If you're heading off on a family vacation, you'll want high-quality, no-nonsense gear that gets you from your front door to your destination in style. 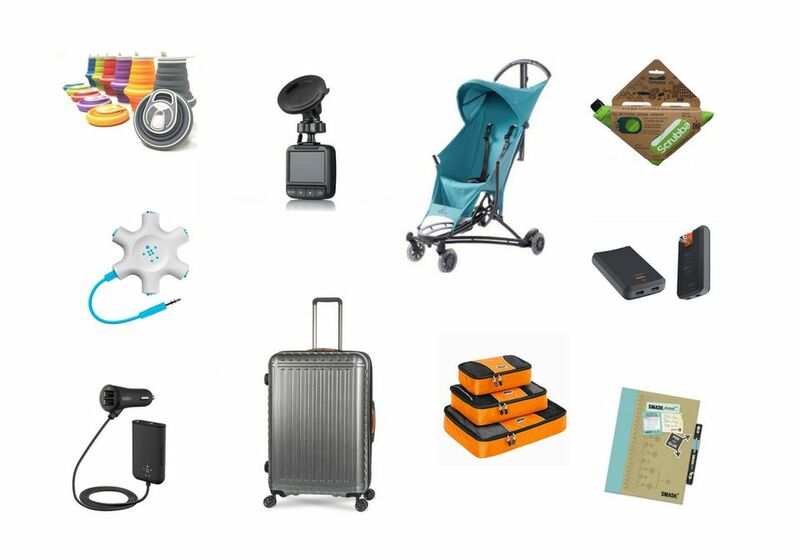 We've got you covered, with everything from tech toys to luggage and beyond. Do family trips to the beach make you feel like a pack mule? Maybe it ain't what you bring, it's the way that you bring it. The ingenious Beachmate is billed as "the essential family beach bag," a customizable, all-in-one portable system that includes your beach toys, snacks, gear and more. The Beachmate is organized so that everything is multi-use and fits together to use space efficiently. For example, sand buckets can be flipped over as sand-free cup holders and lunch trays, and the biggest bucket doubles as the perfect baby tub or kid seat. Each Beachmate includes a tote bag, soft-sided cooler large enough for a day's worth of snacks and drinks, two sand shovels, and five buckets. A beach umbrella can be attached via velcro straps. Finally, no more trying to pull wheels through sand. You carry the whole thing by the comfy wide shoulder strap or you can strap it onto the optional backpack beach chair. Bringing your child's car seat on your travels just got a lot easier, thanks to Mifold, the grab-and-go booster seat that's 10 times smaller than regular boosters but just as safe. It is small enough to fit inside a backpack or glove compartment. While most boosters elevate a child to adult height, Mifold adjusts the adult-sized seatbelt downward to securely fit a child. Two guides hold the lap belt on the child's hip bones, while a shoulder strap and clip aligns the chest strap with the child's shoulder. Mifold has been safety tested and meets or exceeds NHTSA standard FMVSS 213 in the USA. It is designed for kids aged 4 and up, 40 to 100 lbs, and 40 to 57 inches tall. There are times during your vacation when you may need to tote around a big purse, and there are times you want to pare down to just your phone, a few credit cards and a bit of cash. When you want to downsize your load, the Maine-based company Rogue Industries offers some beautiful handcrafted-leather phone wallets. We tested the minimalist iPhone 6 Wallet and the slightly larger Yarmouth Zip Phone Wallet and quickly found both to be practical, high-quality, and stylish options for carrying around just what you need. The Yarmouth Zip Phone Wallet is slightly larger at 6.5 in x 3.75 in x 0.9 in. At first glance, it appears to be a typical women's zip wallet with a wrist strap. Inside, however, you find that it doubles as a phone case, thanks to a gusseted pocket on one side that can hold phones as large as an iPhone 7 and, on the other side, an ID window and five credit card slots. Since this wallet zips up, you can also toss a pen and lipstick inside. Looking for high-quality, affordable luggage that's tough enough for the most rambunctious kid? The iFLY Racer spinner carry-on is both a stylish and practical choice, with its roomy interior, textured hard-sided shell and 10-year warranty. The iFLY Racer is not only built to last, it's built to look good, thanks to Can’t Scratch ThisTM technology that protects the luggage surface from scratches and scuff marks. Fashion-conscious teens will love that there is a roomy main compartment, extra pocket that creates a second compartment and, for even more space, an expansion zipper that lets you can enlarge your luggage. And it scores on maneuverability, too. The iFLY spins and glides with ease, thanks its soft-grip gel carry handles and durable double wheels that ensure smooth 360o navigation. For most drivers, dash cams offer peace of mind that events will be recorded in case you're ever involved in an accident. But for folks who love scenic road trips, these devices have a added benefit: recording the splendor around you as you simply enjoy the drive. Later on, you can easily download video footage or still photos to your computer. Are you as obsessed with finding the perfect travel gear and supplies as we are? The items you decide to pack—or not pack—can make a huge difference to your vacation experience. Here's a gallery of tried-and-tested products we love for family getaways. If you've ever wondered how to keep your wallet and other valuables safe when you're at the beach, pool, or park, the Safego Portable Travel Lock Box Safe provides a convenient, affordable solution. You can use this durable lock box anywhere. Just toss your wallet, cash, keys, phone, camera, sunglasses, and other belongings inside and attach the Safego Safe to a secure fixture (such as a fence, park bench, or tree branch) with the attached flexible steel cable. It comes with two keys and a combination lock. This combo wall charger and backup battery is a must-have travel take-along. The Ventev Powercell 6000+ features folding AC prongs, so there's no need to carry a wall charger for your backup battery. You can charge two devices at once while plugged into the wall or on-the-go with the power stored in the onboard battery. The battery holds a charge that can deliver 25 hours of talk time or 18 hours of Internet surfing. When you've got more than one child but only one tablet or entertainment gadget, the Rockstar is your best friend. Simply plug the splitter into your smartphone or tablet, add in up to five sets of headphones, and presto!—you've got yourself a backseat movie or music party. It's fabulous when you need some quiet time from your peanut gallery, where sharing beats taking turns any day. What do you get when you cross a journal with a scrapbook? Way more fun than either, the hybrid Smash Book is a diary that comes with a glue pen so you can embellish your travel tales with ticket stubs, photos, postcards, and other mementos. At 7-3/4 x 10-1/4 inches, it fits easily in a backpack so you can write and smash on the go. Want to take your vacation photos and Instagram prowess to the next level? The Olloclip 4-IN-1 instantly turns your smartphone into a souped-up camera with fisheye, wide-angle, 10x and 15x lenses. Best of all, the lightweight, compact clip-on design won't weigh you down. Available for iPhone and Samsung Galaxy. If your kid has trouble sleeping in the car or on the plane, this adorable bear Kikkerland Zip and Flip Travel Pillow makes for a cuddle buddy. Open the hidden zipper that runs down its back, turn it inside out, and you get a comfy neck rest. Available in bear, blue whale, or penguin. Sure, most restaurants offer high chairs. But if you're staying at a vacation rental, apartment, or condo, a travel high chair suddenly becomes an essential take-along. Slip My Little Seat over any regular chair and it turns into a high chair. Best of all, it's portable and can be cleaned easily in a washing machine. What's better than a two-port USB charger on a long road trip? A four-port charger that serves both the front and back seats. Belkin's Road Rockstar gives you two ports up front, along with a six-foot cable that runs to the back seat, where a second hub clips to the seat pocket and offers two more ports. It's a simple solution that will keep your family's gadgets juiced until you get to your destination. Feather light? Check. Opens and closes in a snap? Roger that. Easy to carry? Yup. Whether tackling subway stairs, museum escalators, or airport security, the Quinny Yezz may be the perfect travel stroller. When folded, you can carry the 11-lb. stroller on your shoulder and leave both hands free. Unfolding and folding just takes one hand, thanks to a unique 3D folding system that happens in the blink of an eye, making it a breeze to switch from pushing to carrying and back to pushing. If your typical vacation day includes a workout, city stroll, and night on the town, then the old two-pair-of-shoes packing limit just won't cut it. Show us a carry-on that offers enough room for three or four pairs, and we're sold. Consider The Shrine sneaker backpack, a weekend travel pack with two shoebox-size compartments for your footwear (each large enough to hold a pair of women's boots or two pairs of heels or flats) plus a roomy compartment for your clothes. If finding the perfect cross-body messenger bag is something of a lifelong quest, listen up: Ogden Made, a company known for making fabulous handcrafted bags, has turned the classic carrier into the perfect day bag. All year long my family looks forward to spending a week at the Tyler Place, a wonderful all-inclusive summer resort in northwestern Vermont. For eight glorious days, we're outside biking, hiking, kayaking, sailing, paddleboarding, scaling the climbing wall, practicing archery, catching fish and frogs, soaring on the zip line, or playing lawn games like Capture the Flag and Kick the Can. We get dirty every day. At the top of my packing list is our Scrubba Wash Bag, a nifty little laundry bag with an interior washboard that lets you handwash a small load of laundry in under five minutes. It's great to be able to quickly refresh a few t-shirts and shorts and let them air dry on our cottage's screened porch. My kids actually think it's fun to do their own laundry (score!) and clothes get washing-machine clean, not quasi-handwash clean. As much as we'd all like to ditch plastic water bottles for good, most reusable water bottles are too bulky to carry around all the time and so convenience wins out over environmental-friendliness. That is, until now. Talk about clever. The Hydaway is a water bottle that folds down to just over an inch thick to fit into a pocket, purse, backpack, diaper bag, tote, carry-on—or pretty much anywhere. Bring it empty through airport security and then fill it at a water fountain. When you've had your fill, simply collapse it and pop it back into your bag or pocket without worry that it will leak. It's perfect for visits to zoos, theme parks, and other attractions where staying hydrated usually means paying through the nose for good old H2O. Let's face it: If you're going to let your little one play with your iPad in the car or on the plane, then you're going to need a protective case that's virtually indestructible. Lots of iPad cases claim to be tough. But are they toddler tough? Fear not with the STM Dux iPad case, which can withstand any slip, drop, or toss that slippery little hands can dish out. The Dux has passed the U.S. Military Drop Test from a height of four feet and features a convenient magnetic closure and strong, reinforced corners. It's available for iPad, iPad Air, and iPad mini and comes in a selection of kid-friendly bright colors. So bring it, tots, bring it. The trouble with most camera bags is that they end up being just another thing to carry around in addition to your purse or daybag. Not so with the Tenba Discovery Top Load Camera Bag, whose abundance of compartments and pockets provides plenty of room for your wallet, phone, rechargers, keys and other personal items. You can go ahead and ditch your purse; this is the only bag you'll need. We're suckers for travel gear that does double duty. If you hate bulky camera bags but want to protect your camera when it's not in use, consider the Miggo Strap & Wrap, a shoulder-length camera strap that morphs into a protective, padded camera cover in no time flat. The neoprene strap contains a positioning screw that fastens to your SLR or DSLR, as well as a handy pocket where you can tuck the lens cap. When you're not shooting, roll the strap around the device, then tuck it up and over and, voila!—your camera is now ensconced in a tidy, padded package. If you're looking for ultra-tough luggage that will last a lifetime (or a really great gift for someone you love), the name to know is Pelican, a company that made its name designing and manufacturing virtually indestructible cases for military, police, and fire safety personnel. Pelican recently introduced a line of ProGear Elite hard-shell luggage that is not only modern and fun but lightweight, watertight and crush-proof. Models come in three sizes (the 22-inch Carry-On, the 27-inch Weekender, and the 30-inch Vacationer) and five trim color choices (black, blue, orange, purple and red). There's also a built-in TSA-approved combination lock, easy press-and-pull latches, and solid-hub wheels that glide smoothly and quietly. Looking for products that help with wrinkle-free packing? Eagle Creek's Pack-It system of cubes and envelopes are wonderfully flexible for organizing clothing items and lessening the shifting that happens when your suitcase gets lugged, rolled, tossed and lifted along your journey. Affordable wrinkle-free packing is attainable with packing cubes from eBags. Keep in mind that when clothes shift in your suitcase, it causes wrinkles. Packing cubes keep your belongings tightly contained and consequently wrinkle-free. If you're into cleverly designed luggage with tons of handy compartments and pockets, then you're probably already be a fan of the Tom Bihn line of bags and backpacks. We also love Tom Bihn packing cubes, which keep clothes wrinkle-free and come in a variety of sizes. Pack a travel-size spray bottle of Downy Wrinkle Releaser Plus and you can keep your clothing wrinkle-free on vacation. Just hang up the item and give it an even spray. Wrinkles disappear in a few minutes with just a few spritzes. Ziploc storage bags have a zillion and one uses on a family vacation and are a packing essential for holding toiletries, underwear, and any items that can get sticky or wet. The gallon-size bags are also perfect for holding a single baby or toddler outfit (diaper, onesie, top, bottom, socks), and they've even been used to turn a tablet into a hanging movie screen. It's handy to have antibacterial wipes with you when you travel with kids, whether to sanitize hands before roadside picnics or wipe down the germiest items in your hotel room. While many brands claim to get rid of virtually all bacteria, your hands will thank you for using Wet Ones, which contain moisturizing aloe and won't dry out your skin.